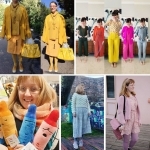 I might not have time to squeeze in any more sewing this year – I’m all done with work and off on a little holiday before Christmas – so it’s a good time to reflect back on another year of sewing by doing my Gillian’s top five. Here they are! 1. My Named Yona coat was one of this year’s first projects back in January. 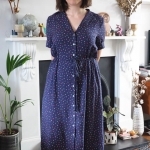 It’s on its second winter now and holding up quite well, although I wish I had used a better quality interfacing as it has sagged and stretched a little bit through the raglan shoulder seams. I also think I need a slightly warmer or fasten-able coat if it gets any colder. But style-wise I still adore this coat! 2. This rib-knit Celine dress feels like me in dress form. I love it and feel great whenever I wear it, and it always gets comments! I gotta make another one, it’s just such a pain to cut out that I’ve been resisting it, ha ha. 3. While this black midi V1501 is not a wardrobe regular, it still makes my favourites list because I am so pleased with the fabric, construction and minor pattern hacks I put in to make quite a unique dress. 4. It’s been a Named-heavy year! Mt first Inari dress set the scene for making a few others. This fabric’s held up really well and I think it’s still my favourite of them all. 5. This starry silk Named Helmi dress is another one that I always feel awesome in and really represents the sort of style I try to shoot for. (I just wore it on Friday to celebrate my last working day of the year, hurrah!) Again I was really pleased with the construction I achieved and must make another one soon. Looking at my list, I think there’s definitely a correlation between sewing enjoyment factor, quality of the result, and frequency of wear/wardrobe success. I don’t always get it right and there have certainly been garments this year that haven’t made the grade. But I do think it’s been a good year of solidifying my skills and making better choices about fabrics and silhouettes to make garments I’ll love to wear. 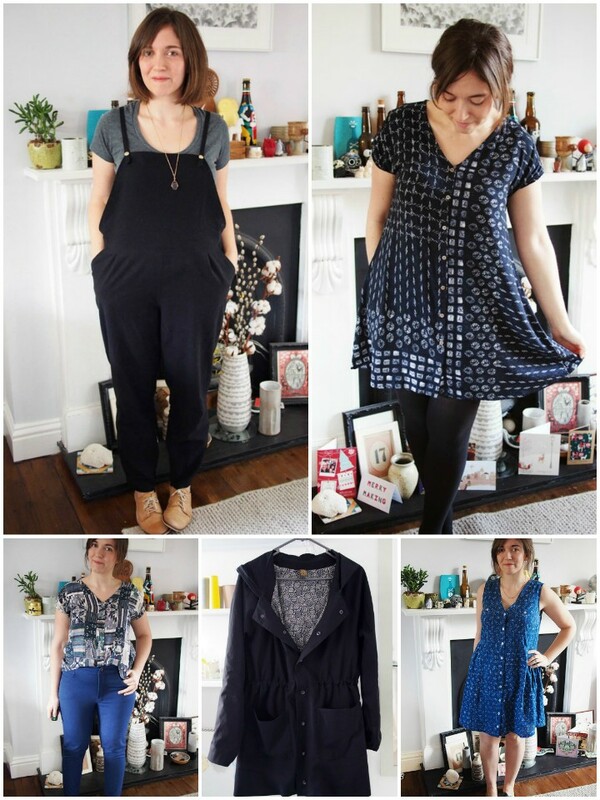 I also thought it would be good to look back a further year, and see which garments from 2015 are still going strong. As sewists it’s often our goal to make long-lasting and non-disposable garments, and I could definitely do better at this. But here are some older makes that are still in regular rotation. My black cotton Roberts dungarees are still my go-to on ‘nothing to wear’ days. I love them! Likewise this Shibori swing dress is trans-seasonal and so easy to wear. Of all the jeans I’ve made, not that many have stayed the course; these Blue Gingers have done because the fabric has such great recovery and hasn’t bagged out (and I still love that shirt too!). 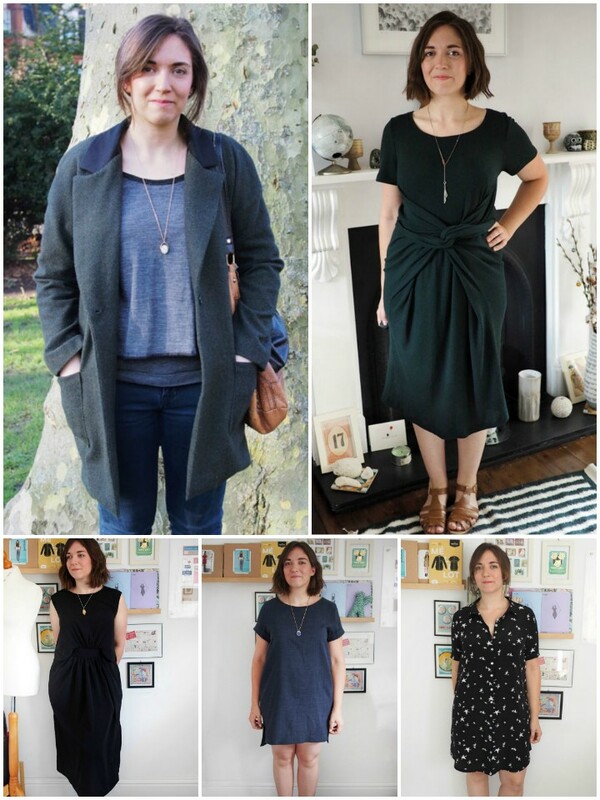 My black Waver jacket got a second season of wear in the autumn before it got too cold, and my lovely Alder dress gets rocked out every summer – and is safely packed for my upcoming holiday to Mexico! Ha ha indeed, I think I have my (lack of) colour palette down! Top marks for being the first 2016 review I’ve read this year. I love your Yona and Waver coats. I think your versions are so much more stylish than those pictured on the Named website. Actually, I really need a new coat and I’m now wavering between the Waver and Yona. I’m just wondering whether they will keep me warm in the winter months. I was thinking of making the Waver in a wool as a warmer option – with cosy fabrics and perhaps interlining it could do the trick. I love how you’ve included a top five from last year as well, I’ve shamelessly copied you! Your picks for this year are gorgeous, I still love your Celine dress, the colour is beautiful. Nice round up. I think it’s a terrific idea to look back on what still gets worn well over a year later. For me so much of it comes down to fabric quality – my seams might be holding up but the fabric sadly often not so much! Yes indeed. I still have a horrible habit of accidentally shrinking or ruining things in the wash too! I love your starry silk Helmi best of all but honestly your Roberts dungarees are a close second. I really like how you’ve identified your style and what works in your wardrobe. 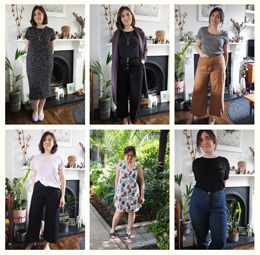 A process I’m deeply involved in right now – what do I actually wear a LOT, what suits me, what I LIKE to make and working to make these three pieces come together into a cohesive project plan for 2017 :) Thank you for this inspiring post! These are all really great! I love your style :) I love the Helmi especially, perfection. I love all the garments you chose and I’m glad to hear some of last year’s makes are still in heavy rotation. Everything you make seems so wearable and so you!